"Sometimes an album catches you off guard, rising from nowhere and roaring into your ears with new sounds and ideas. Such an album grows on you over time, and eventually can reorient what music and sounds you thought you liked. 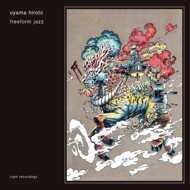 Freeform Jazz, released by Japanese producer and multi-instrumentalist Uyama Hiroto, is such an album. Emotionally rich, culturally diverse, and technically brilliant, it’s the artist’s third full-length release, his first since 2014’s Freedom of the Son. Jazz both cultivates and reflects a mood. Whereas for example Coltrane’s sound reflected the manic scuffle and sense of possibility of urban Black America post-Great Migration, and Flying Lotus represents sonically on You’re Dead a contemporary existential crisis experienced by many African Americans, Uyama Hiroto’s jazz represents the serene, but striving lifestyle among the artist and his cohorts in Japan, highlighted by views of the ocean and mountains, surfing sessions, and simple pleasures like “coffee and bread” as Shing02 says. If Uyama Hiroto’s music never garners the same internet cult following which surrounds Nujabes’ music, it may be all the better. The artist seems to make music to express his own inner prides and passions, and not to start a revolution of style, or stir the hearts of millions. Nonetheless, Hiroto’s Freeform Jazz inovates, excites, and exemplifies the magic that can happen when styles, cultures, and technologies blend through music in just the right proportion."